Sponsorship: the ​act of ​providing ​money for a person or an ​activity in ​exchange for ​advertising or promotion. Still one of the fastest growing forms of marketing in the UK, sponsorship, when done well, offers significant opportunities for distinct marketing and competitive advantages. Many marketers will tell you that sponsorship should not be confused with advertising – as advertising is considered a quantitative medium, whereas sponsorship is considered a qualitative medium. However, whilst that may be true of events (eg. trade show sponsorship, exhibition sponsorship, awards sponsorship, etc), this is certainly not the case in sports where the sponsor’s name or brand is clearly emblazoned across the team shirts, racing car, merchandise, etc and promoted to millions of fans/spectators day in day out. And, as we already know about sports sponsorship, take up rates of sponsoring brands are high among fans and followers who claim a personal emotional stake in their favourite sport, team, player or driver. Design Inc have first hand experience in sports sponsorship, not only in some of our team members’ previous jobs but also in the past few years with the sponsorship of our local football team and some locally-based drivers in various motor racing championships. And this has served us well, getting our name & services more widely known, creating networking opportunities and building upon our support of the local community. In 2016, Design Inc are following a highly talented driver from our home town, Staines-upon-Thames. 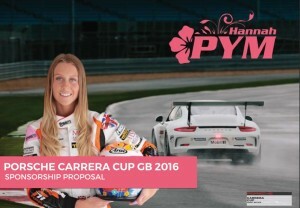 Hannah Pym will compete in this year’s Porsche Carrera Cup. In our opinion, she is a sponsor’s dream; talented, focused, presentable, professional, approachable. And quick, very quick. Hannah is currently offering some very interesting motorsport sponsorship opportunities for 2016 and, for those companies who are interested in joining a group of like minded sponsors, we are pleased to present her sponsorship brochure. Full of details introducing Hannah, her career history, the Porsche Carrera Cup championship, sponsorship opportunities and benefits, the brochure has been designed to provide all the information a potential sponsor will need. To view Hannah’s sponsorship brochure, simply click on the image beneath.